"I ain't no hero, and I don't expect no happy endings neither. You ain't no hero either, and you'd be a fool to think you were." Independent film producers, Zero Pictures, take on the Old West in this black and white feature, co-directed by stars Michael Kastenbaum and Jon Jacobs. Shot on location in Cody, Wyoming for a mere $8,000, The Wooden Gun delivers far more than its meagre budget would suggest. The sheriff (Stephen Polk) has it in for Jake Finney (Jacobs), a former marshall turned legendary gunman, and if he gets his way, Finney is on his way to the gallows in the morning. He won't be alone though, as Steve West (Kastenbaum), a naïve young man is also in line for the noose for his involvement in a bank robbery. Finney has other ideas, and almost makes good a clean escape by bluffing with a hand-carved wooden gun, but when West opens his big mouth promising a share of his loot from the robbery if Finney will take him along, he inadvertantly alerts the other deputies. A blood bath ensues leaving both men on the run for murder. After discovering his partners have betrayed him, West pleads to have Finney take him to Canada. With the sheriff and his posse hot on their trail, the pair come across Annie May (Dawn Kapatos), a fiery young woman who eventually joins them, against Finney's better judgement. When she and West spark up a romance, it leaves Finney to try and come to terms with his own unrequited love, and the consequences will lead to a final showdown. One of the challenges of making a film on such a low budget is that performances are often compromised in the process, but that isn't an issue here. 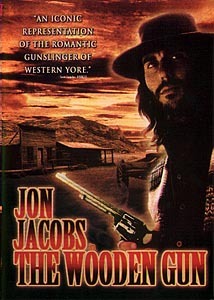 Jacobs carries the role of gunslinger well, providing an even, convincing performance. Kastenbaum portrays his inept tagalong character admirably, and Dawn Kapatos provides a feisty female counterpart. Even the young boy who plays a pivotal role in the final scene comes off naturally, and nails the poignancy of the ending beautifully. The script is tight with some interesting angles, and except for a few places, holds together extremely well. The story combines the action, adventure and romance one expects from the genre, while providing some well placed twists and turns that pack a punch. The plot unfolds nicely as our reluctant hero deals with his new found responsibility, and his back story is exposed against a backdrop which the cinematography captures with the feel of the classics in its scope panoramas. From its open ranges to its standoff gun battles, The Wooden Gun was an enjoyable ride with all the trappings of the Western tradition, despite its very small budget. Image Transfer Review: The Wooden Gun is presented in a 1.85:1 nonanamorphic widescreen transfer. This was shot on 16mm, so there is a good deal of grain present, which does tend to be a bit noisy with errant color information, and has some unnatural transfer-induced, qualities about it. Contrast is reasonable and there is a definite gritty "look" to this picture, which works in its favor. There are a few video anomalies in dropouts and the odd encoding error. Still, this is very watchable, if not up to the highest technical standards. Audio Transfer Review: The stereo surround track is surprisingly good for a low budget picture. There is some decent directionality, the score is strong, and dialogue easily discernable. Hiss and other spurious noises are infrequent, but there are a few dropouts here and there. The foley, particularly gunshots, could have been afforded more authority, but given what this film cost, this is more than adequate. The title song is still stuck in my head. Extras Review: Extras are slim outside the motion menus and trailers for other films in the Zero library, including Lucinda's Spell (available in a new special edition), Dogstar, The Invisibles, The Wooden Gun, Pheonix Point, Hero Lover Fool, Mic and the Claw, Welcome Says the Angel, The Girl With the Hungry Eyes, The Blue Door, Rage, and Prometheus Bound. Although they also appear in their own submenu (hint: select either menu option to reveal all the titles), they are also forced to play at the start of the feature, so use the chapter selection to bypass these if desired. A short introduction to Zero Productions and their philosophy is included. A collage of interview clips with the principles and actors highlights enabling filmmakers to be able to create, regardless of lack of funding. It would have been nice if this were a little more film specific, but it does give a decent overview of the mindset behind these pictures. A 5m:26s commercial for the online Project Entropia RPG rounds out the supplements. While it doesn't have the glitz and gloss of a major production, The Wooden Gun has it where it counts. This modest indie delivers strong performances, a solid story with plenty of excitement and adventure, and goes to show that money isn't everything in filmmaking. I'm impressed.